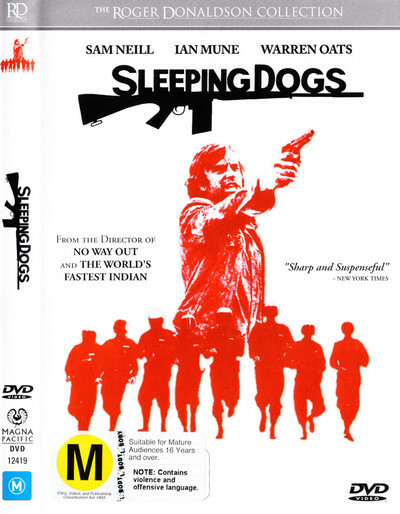 Roger Donaldson's "Sleeping Dogs," from New Zealand, is a very well made and acted movie about a time in the near future when New Zealand goes into a state of martial law, and underground groups form to fight against the dictatorship. Donaldson uses precise details of Hitler's takeover of Germany and plugs them into the New Zealand setting, and then he gives us a hero who wants to sit the fight out and is publicized by the government into being a symbol of opposition. American troops are sent in to help the New Zealanders put down the "rebellion," and the rebels conduct a running guerilla battle against them. The movie resembles "Z" and "The Battle of Algiers" in the way it combines ideology with fiercely-paced action. The biggest box-office hit of its time in New Zealand, it launched Donaldson's career. In 1982 he directed "Smash Palace," with its strong performance by Bruno Lawrence in the story of a man who grows desperate when he loses custody of his daughter. Then he moved on to Hollywood, becoming a successful director of thrillers and adventure movies.